On our way through to Uluru and Utopia, Jennifer and I have stopped in a beautiful country district outside of Melbourne called The Dandenongs. I’m photographing a wedding here tomorrow for a friend. When we checked into our B&B, the lady at reception gave us a brochure for a local tourist attraction – some kind of sanctuary. As she handed me the brochure she said very pointedly: You have to go here. I don’t do sanctuaries as a rule. Whatever is in a sanctuary I figure is best seen outside of a sanctuary, in the wild. I’ve been to koala sanctuaries, and kangaroos sanctuaries, and cockatoo sanctuaries, and I’ve always found them slightly sad places. So I was not in a mood to visit a local sanctuary. I took the brochure, because I am a polite person, but I didn’t even look at it. But there was something in the way the woman said You have to see this that caught my attention. It was a message. I had to see it, whatever it was. Today Jennifer and I visited this sanctuary. It wasn’t a wildlife sanctuary, it was something far more enriching. It was a sanctuary for contemplation and reflection. 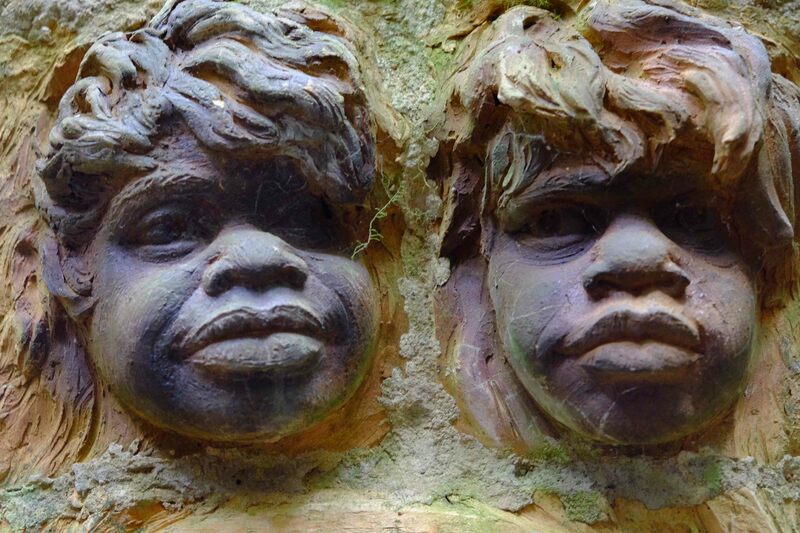 A spiritual sanctuary, celebrating aboriginal beliefs. It had a profound and deeply moving impact on me. I would rate it as one of the most important spiritual sites in Australia, and strangely a crucial precursor for the coming week, when we drive up into the Outback, and into aboriginal country. 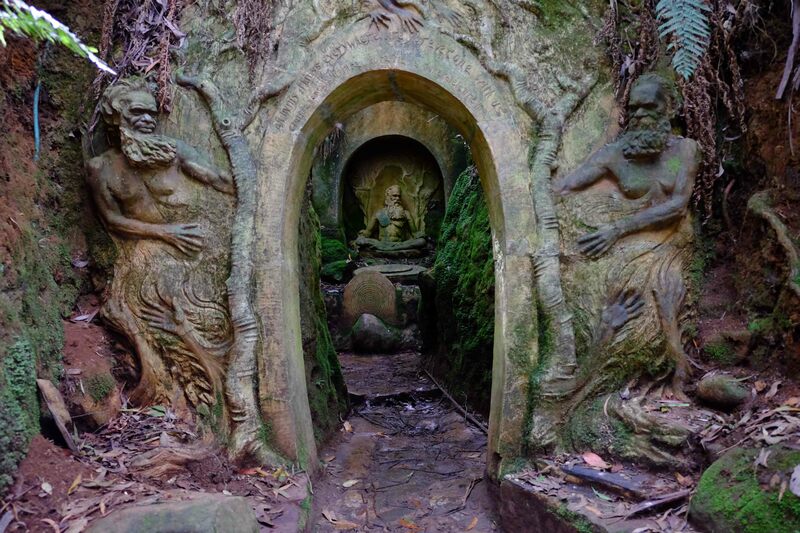 The sanctuary is called The William Ricketts Sanctuary. William Ricketts was a potter and sculptor who was born in 1898 and died in 1993. In the the mid 1940s to 1960s he made frequent expeditions into Central Australia, where he lived with the Pitjantjatjara aboriginal people in the remote desert regions north of Alice Springs, which is where Jennifer and I will be in five days. Ricketts became inspired by their philosophies, particularly their strong spiritual link to the land. When he returned home he bought several acres in Mt. 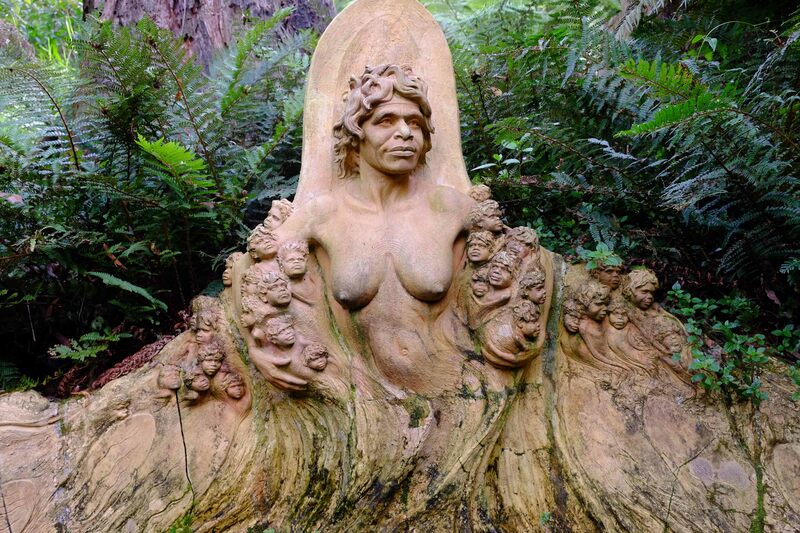 Dandenong – full of ferny glens amidst ancient rocks and majestic eucalypts – and began to make clay sculptures that reflected what he’d learned from the aboriginal desert people. 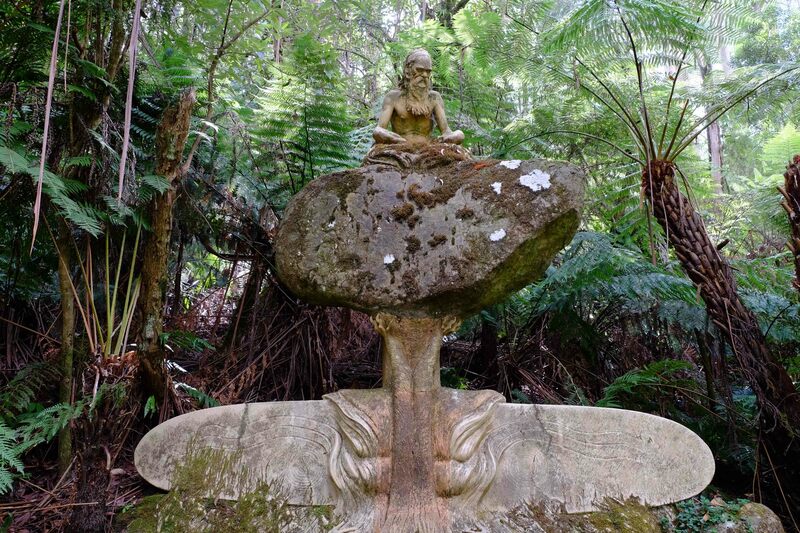 He devoted the rest of his life to creating a place of mysticism and spirituality, where his sculptures sprung from the rocks and the trees, representing the aboriginal beliefs of a spirit world within the land. 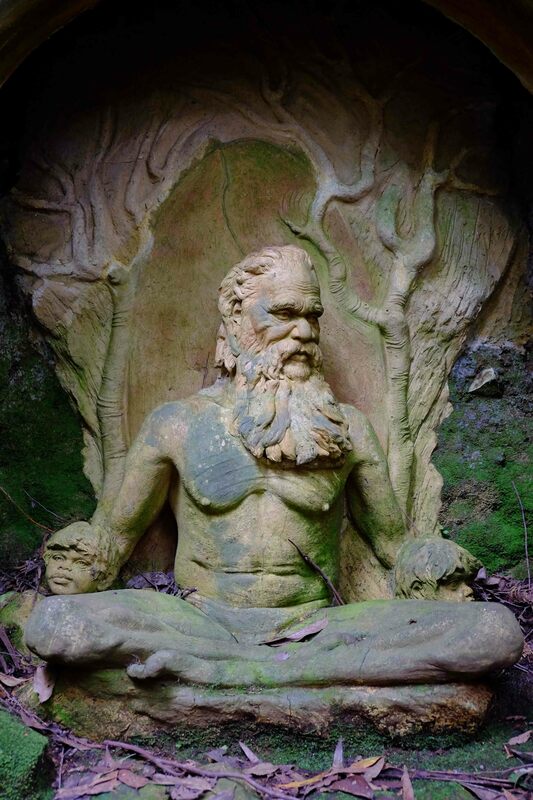 In the 70s he traveled to India, and spent two years in an ashram in southern India, studying Hinduism and coming to the understanding that there was harmony between the beliefs of the Australian aboriginals, and the Indian Hindus. 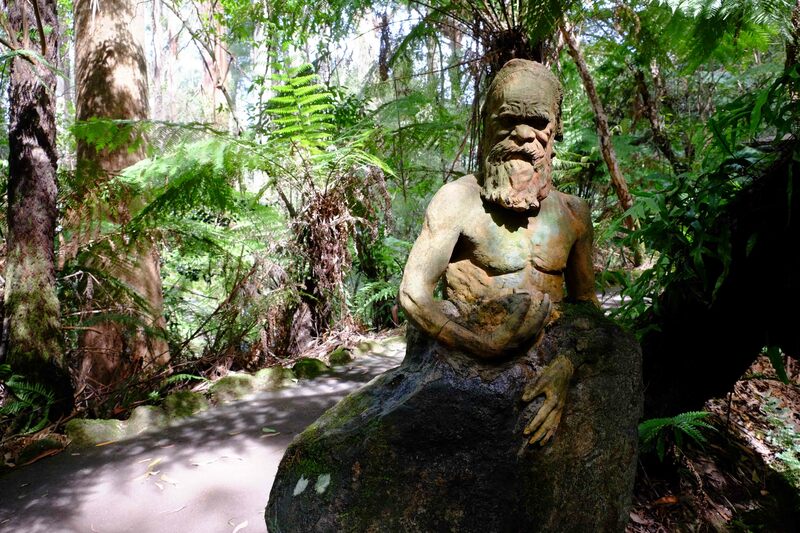 Before his death his land with more than ninety sculptures was bought by the Victorian Government, and is now a public park, visited each year by thousands of people from around the world. Today, walking through the park, I found it to be a place of enormous tranquility and respect. 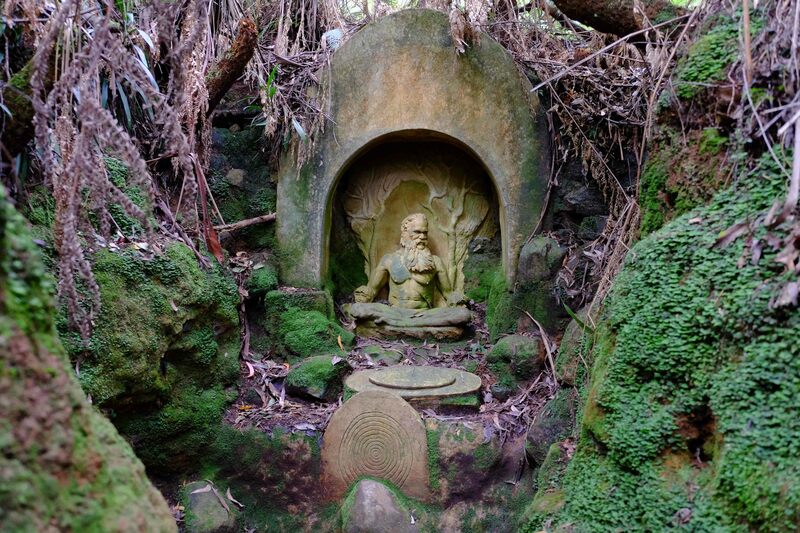 It reminded me a little of the park surrounding the Yogananda Self Realisation Temple in Pacific Palisades, in Los Angeles, full of sculptures of Krishna and other Ascended Masters. 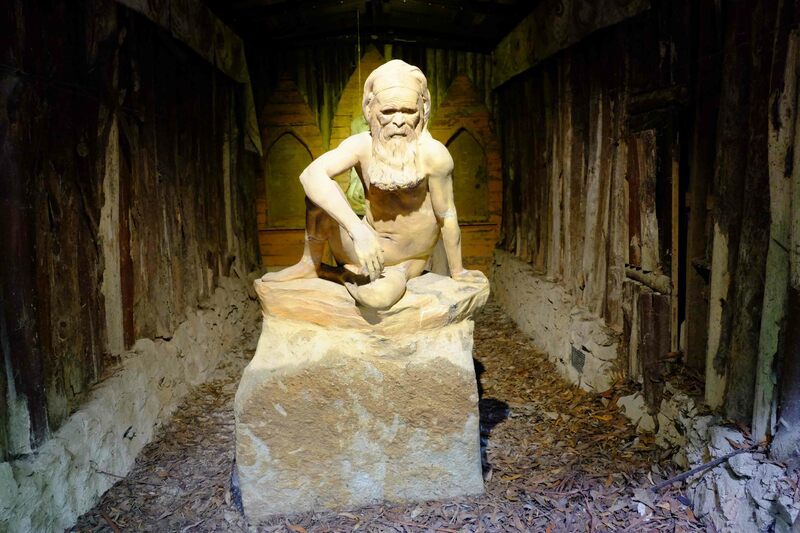 For me, the power of Ricketts; sculptures lies in the enormous dignity he bestows on the aboriginal people, and their spiritual beliefs. Life is love. 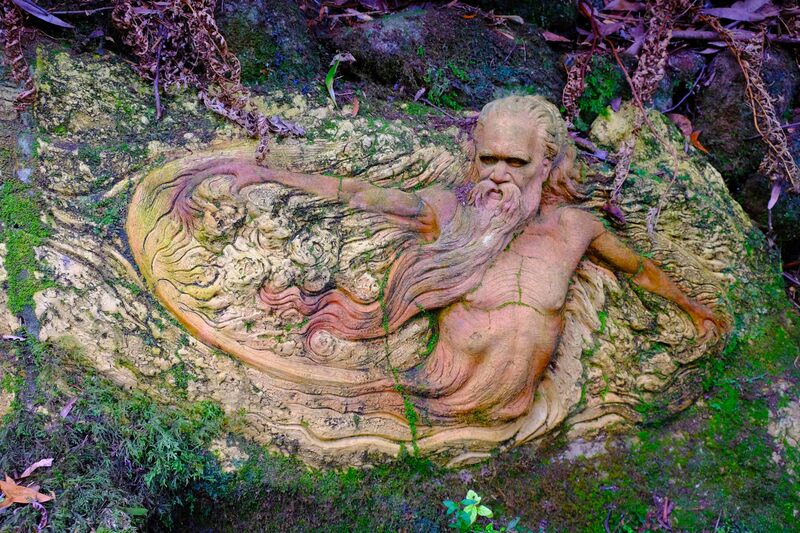 All you to all me, for being part of nature we are brothers to the birds and trees. Will you then join with us in the sacredness of beauty, because at our highest, we part of the beauty of this world. 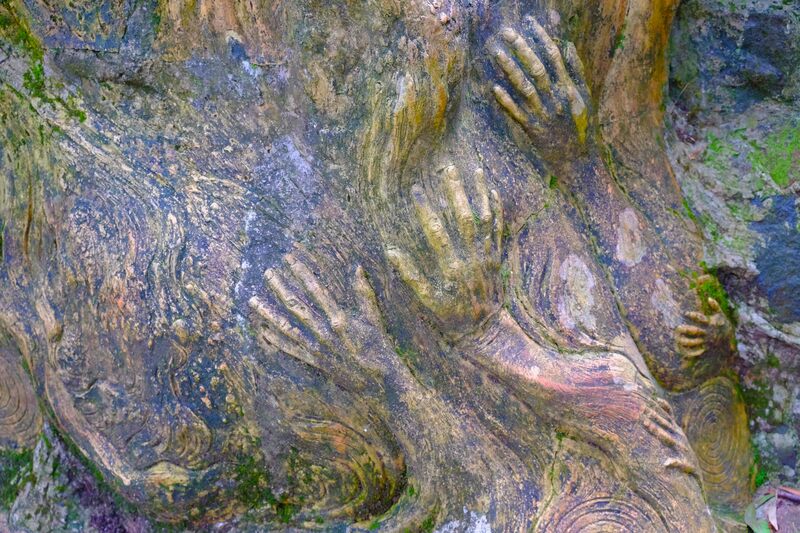 We know we are part of the Creator and Designer and so in this expression of our minds and hearts and hands, we give back to God what emanates from God. The only way to retain love for oneself is to give it abundantly to others. God Love – pulsating in a rhythm that moves and sweeps through all life. To understand your highest self you must live in that rhythm. It was very strange how Jennifer and I came to this place today. But of course it had to be… it was necessary for us to come here to prepare us for what’s to come. 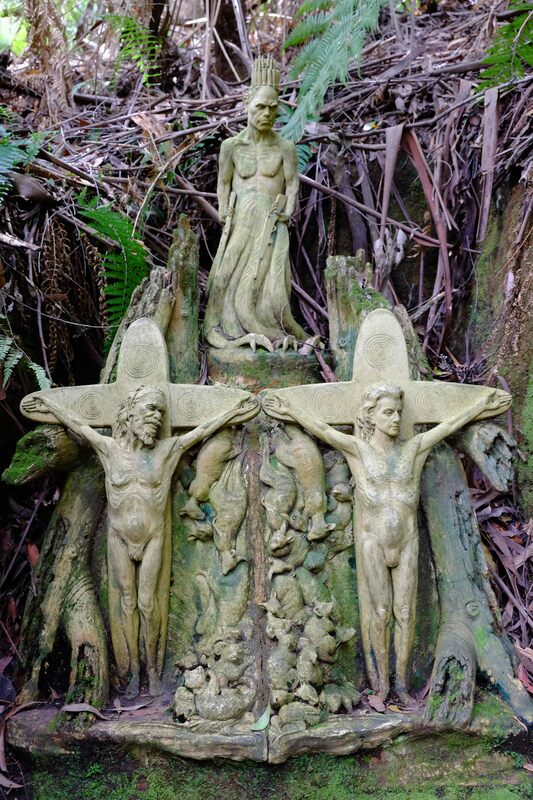 This entry was posted in Post Camino and tagged aboriginal spirituality, Dandenongs, Mt. 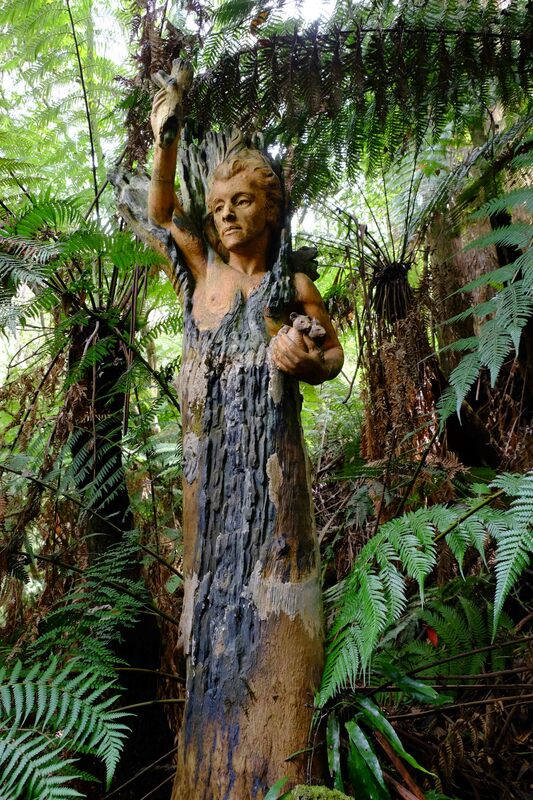 Dandenong, William Ricketts by Bill Bennett. Bookmark the permalink. Oh my gosh Bill… I have chills going up and down my spine. …Goosies. if I ever come to Australia..this is where I need to go. 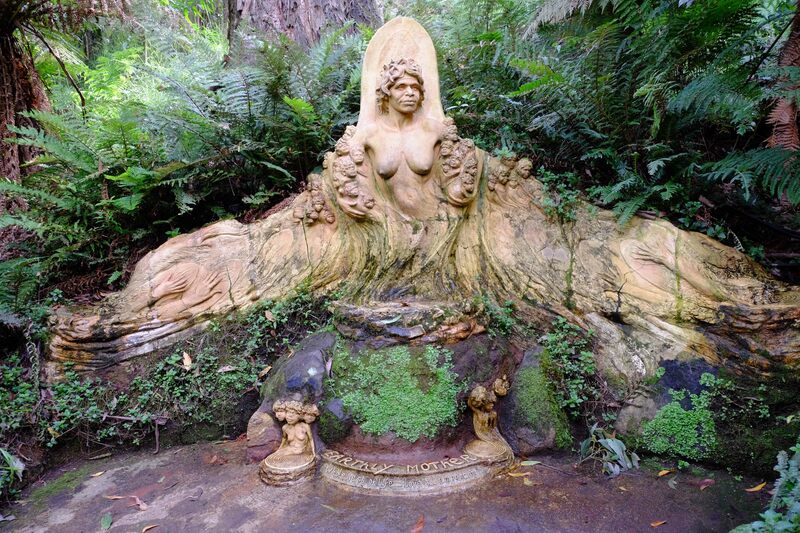 WOW, Bill, I’ve visited many parts of the Dandenongs in the last 40 years and never knew of this. Definitely going next time. I always love the drive up through Ferntree Gully – like a natural cathedral of fern trees and gums. What a wonderful place for a wedding!